Do We Even Like Chickens?? The Givens Grove > Farm Players > Do We Even Like Chickens?? So three years ago we decided we needed chickens. Okay, I decided and my husband didn’t exactly put up a fight. So that qualifies as “we” correct?? Let’s not get distracted by details. Chad suggested we start out with four chickens. That seemed reasonable since we had never owned chickens. We needed to feel it out and then add to our flock once we knew chickens were a good fit with us. And then along came My Pet Chicken. I had already decided I wanted a mixed flock so the girls, then 4 and 2 years old, could name them and tell them apart. Oh the combinations of chickens at My Pet Chicken were endless and I had only four spots. YIKES! I decided I would put all the top runners in my basket and then narrow the list down from there. 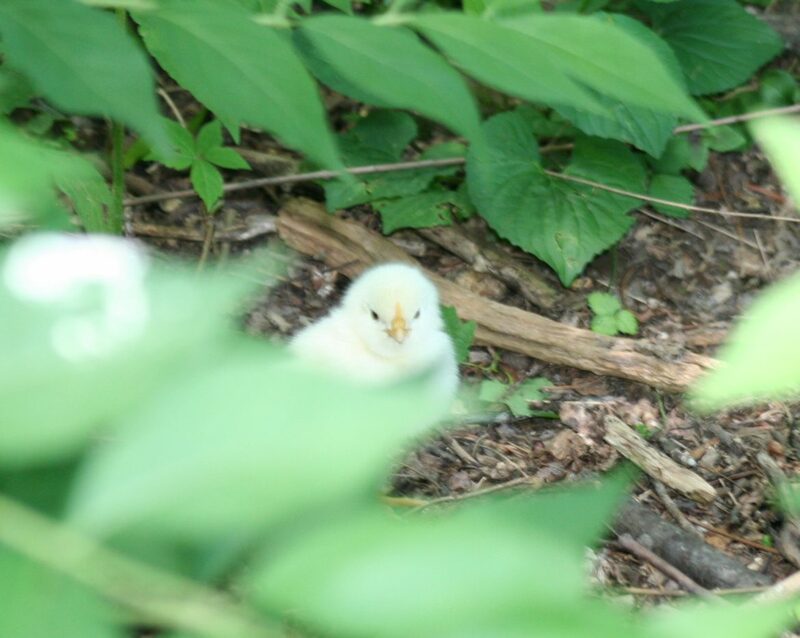 I ended up with no less than 20 chicks in my cart (my husband should have realized then I had a problem…..a serious inability to say no to beautiful chickens). That was an issue. So I presented to my husband that we “needed” more hens so we could have enough eggs per week average to feed our family. It worked! Score baby! I got the number bumped to eight. Double the chickie awesomeness. So one by one little chicks were deleted from the cart. It was a slow, hard, tiresome process. Which chicken lays the best? Is friendly with kids? Forages well?? Obviously they need to be pretty and I want multi-color eggs right? I finally narrowed it down to eleven chicks. I just couldn’t delete one more from the cart. I had done my best and I needed each one……okay, I know “need” is a strong word but that is what it felt like. I did mention I have a problem right?? Yet again I went back to Chad and laid it out, plain and simple. “I just can’t narrow it down any farther”. I must have sounded like a lunatic. I can remember him sitting there just staring at me, and then he said “we don’t even know if we like chickens.” I really had no argument with the man. He was right. But, he loves me and let me have the eleven chickies. Whoop whoop! We then had to wait three painstaking months for our order to arrive at a time that wasn’t freezing and snow on the ground (we ordered in January to receive in April). Your order ships out on a Monday (at least this was the process they had then, check out their website for up to date shipping info www.mypetchicken.com ) and you receive it between Tuesday and Thursday. I got the lucky phone call Tuesday morning from the post office at 6 a.m.. I told my husband he had the kids and would have to wait to go to work till I got back. One of the many perks of his job at the time, working for his dad. I ran to the post office as fast as I could and listened to their little peeps all the way home! I couldn’t wait to get them out. When I got them home I was totally prepared for their arrival. When I say totally prepared, I mean I was not expecting them until Wednesday and had nothing put together. Not in the slightest what they tell you to do in the My Pet Chicken Handbook. It was somewhat stressful trying to put it all together with chicks jumping out of boxes, babies trying to paw at them and trying to remember where I put the darn brooder light. But I absolutely loved it. I knew from that moment I loved chickens and they would always have a place where ever life took us. That is one happy farm girl!! 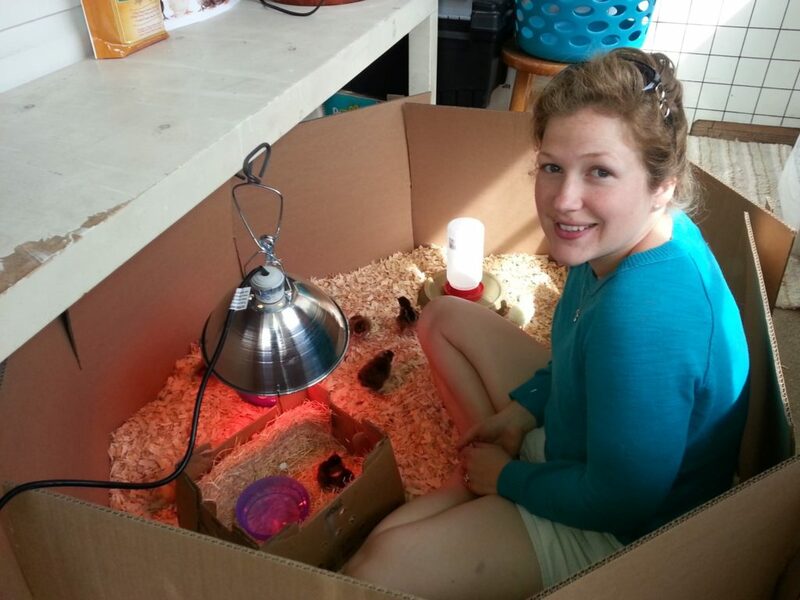 The poor chick in the box, Penelope, was weak when we picked up our package. But more on her later. But just so you know, Penelope lived to chirp another day and eat a pearl earring right off my ear several months later. Darn chicken. What do you do with one pearl earring. Why I am still holding onto a single earring, I have no clue. If you have any suggestions or ideas, please pass them on. I just can’t seem to bring myself to throw it out! Ha! This had me cracking up!